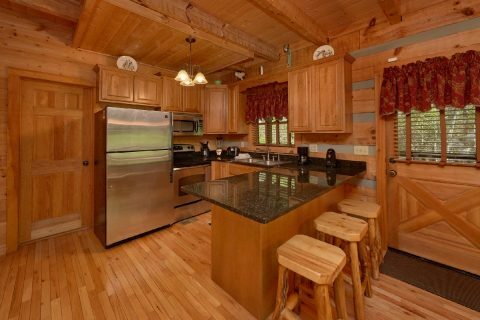 Searching for a charming 1 bedroom cabin with a lovely creekside location? 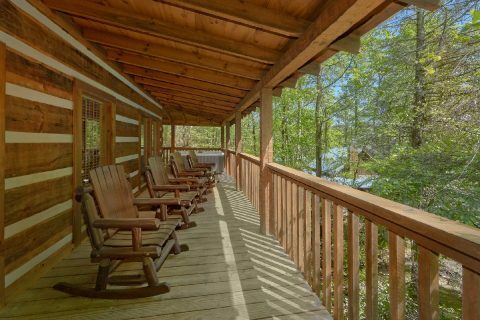 Come experience "Kicked Back Creekside," a lovely 1 bedroom cabin rental that boasts a beautiful setting in the Great Smoky Mountains near Pigeon Forge! 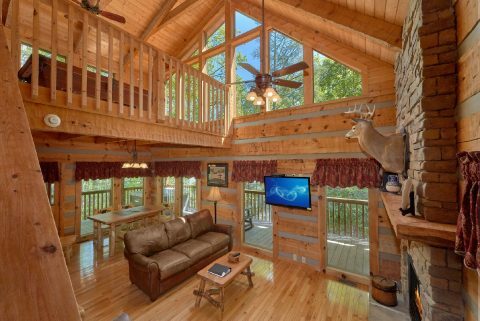 With an excellent location in the Bluff Mountain Road area of Sevierville, this cabin places guests only a 5.5-mile drive from the heart of Downtown Pigeon Forge, TN! 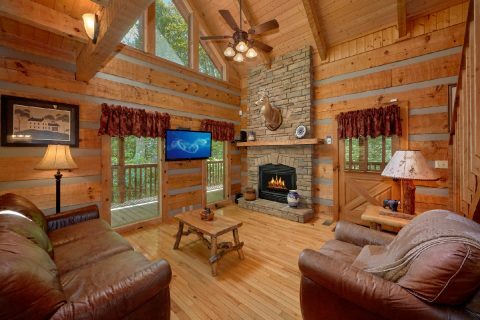 As a result, guests of this cabin will enjoy quick access to attractions like The Titanic Museum, Dollywood, and The Hollywood Wax Museum. 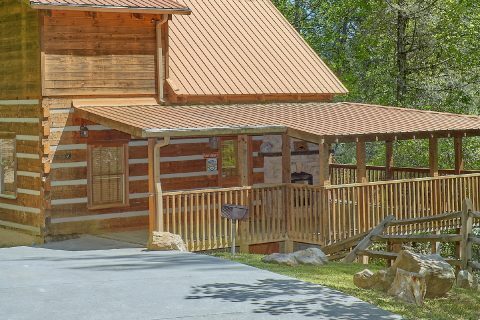 Whether you plan to spend your day hiking in the Great Smoky Mountains National Park or seeing fun shows on the Pigeon Forge Parkway, you'll love returning to this convenient cabin nestled in a peaceful creekside location. 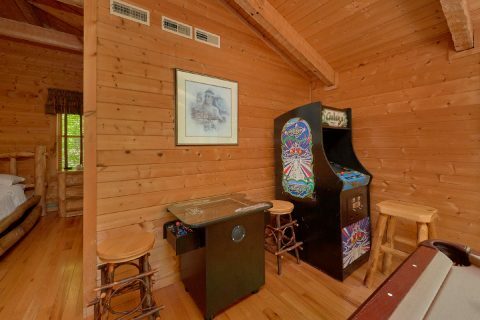 Enter into the main level of this cabin and you'll find a cozy living room area complete with a double-sided gas fireplace that can also be used on the deck! 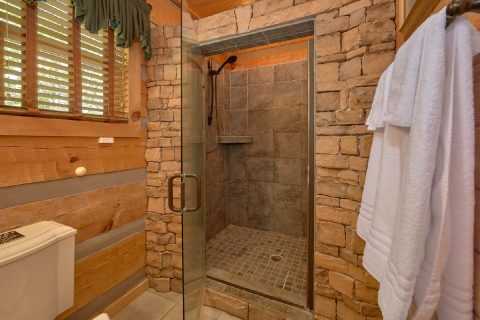 This level is also home to a full bathroom with a stand-up, tiled shower. 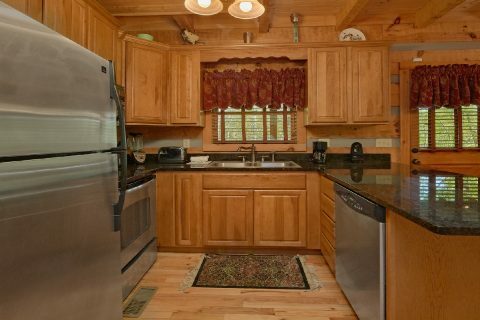 Nearby, you'll find this cabin's full kitchen and dining area, so you can save your vacation dollars by making tasty meals in the comfort of your cabin. 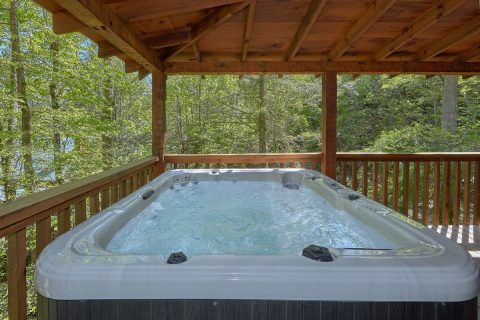 From here, you can step outside onto your cabin's deck to enjoy the warm waters of the hot tub or the outside gas fireplace. 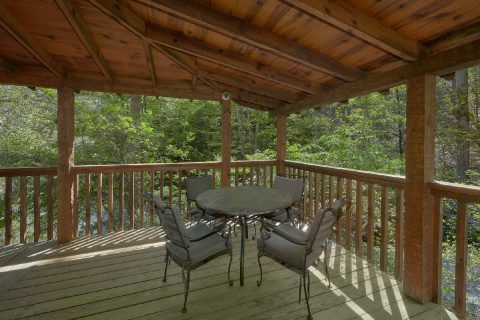 This deck is close to the creek, so you can truly unwind while you listen to the peaceful sounds of moving water. 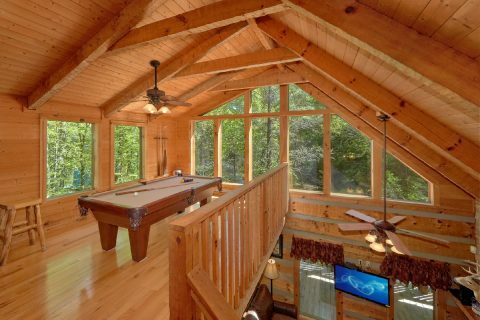 To enjoy a fun game of billiards or to play a fun game, head upstairs to the lofted game room area that comes complete with a pool table and an arcade! For some old-fashioned entertainment, you can always enjoy telling ghost stories around your cabin's outdoor fire pit underneath a starry night's sky. 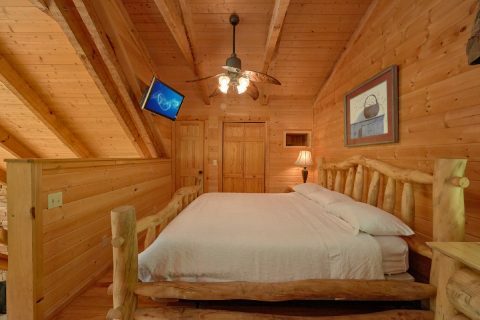 Once it's time to get some rest, you can look forward to getting a good night's sleep in this cabin's bedroom. The main level is home to a private queen-size bedroom. 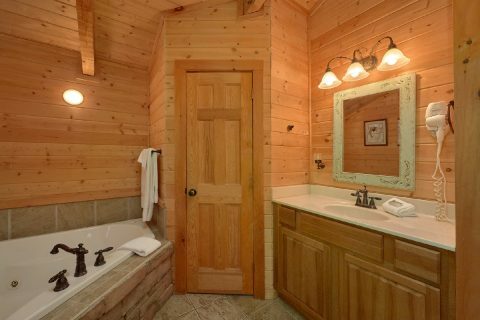 Upstairs, you'll find a king-sized bed in the loft, along with an in-suite jacuzzi tub and a half bath. 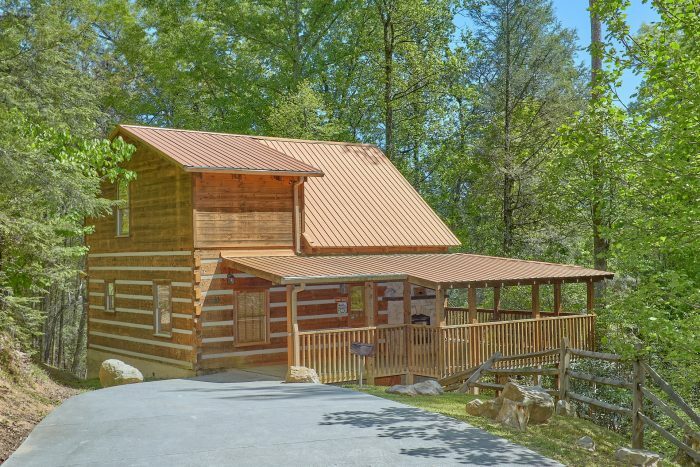 Altogether "Kicked Back Creekside" can easily sleep up to 4 guests in comfort. Need more comfortable sleeping space for your vacation? 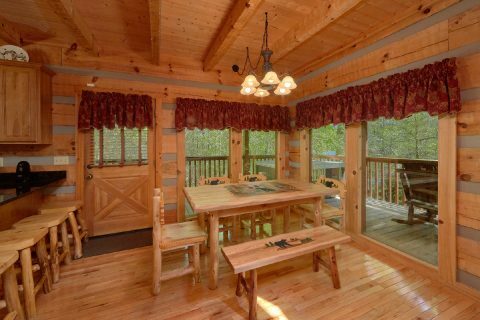 This cabin is located near "Turtle Dovin" and "Cuddle Creek Cabin." 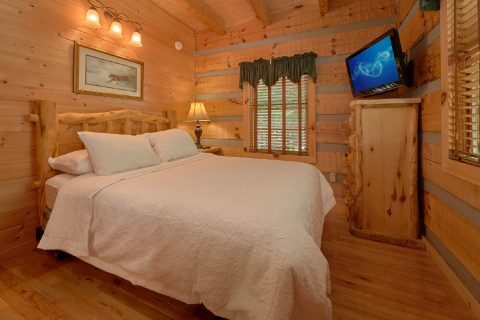 You can easily book more than one cabin rental for your stay. Simply contact our reservations office if you're interested in planning a multi-cabin vacation! This rental also comes with practical features like WiFi, a washer/dryer, and a charcoal grill for you to use during your stay. 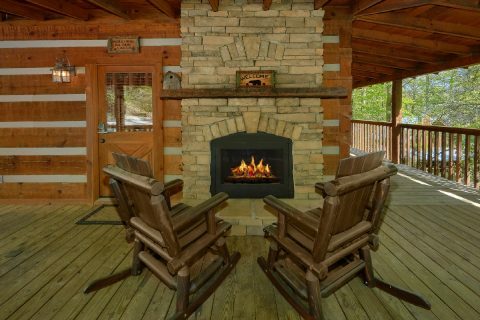 Start planning an excellent Pigeon Forge vacation when you book "Kicked Back Creekside" with Cabins USA and you'll save 15% on your nightly rate in the Great Smoky Mountains of Tennessee!